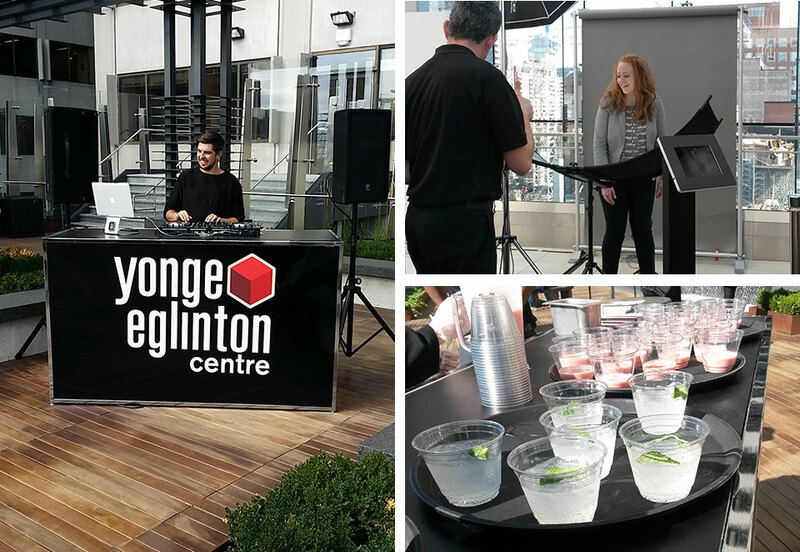 Yonge Eglinton Centre Grand Reopening Celebration! | circus strategic communications inc.
Yonge Eglinton Centre Grand Reopening Celebration! Yonge Eglinton Centre (YEC) is a mixed use property located in the heart of Toronto. The shopping centre recently completed a makeover that included 45,000 square feet of retail offerings, including the largest Sephora in North America, dynamic interior visuals, and a spectacular rooftop patio open to residents, retailers and shoppers! As the renovation came to a close, it was time to gear up for a celebration in true YEC style! As their agency of choice for this celebration, the circus team created a truly spectacular week of high energy entertainment, fashion events and interactive engagement. It was a party from the rooftop patio to the outdoor stage and everywhere in between. circus developed and executed the event right down to the smallest detail… and in less than 6 weeks start to finish! circus developed the bold creative message for every touch point. Each visual asset and media clearly and consistently promoted the event, from TV spots and online ads to giant in-mall digital screens, oversized floor decals and a mobile LED video truck located on the outdoor stage. Let’s just say you couldn’t miss the message! Over 800 tenants partied with us on the patio. Highlights included a custom designed invitation, a unique email RSVP application, a corporate profile photo op, Sephora make-up applications, and of course, a DJ and decadent refreshments! 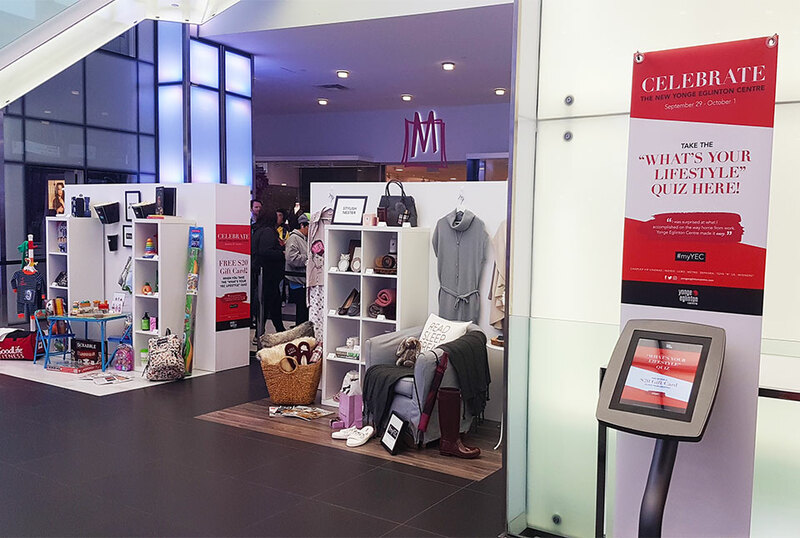 YEC offers the right mix of stores and services to meet the needs of almost any lifestyle and we wanted to demonstrate it through an interactive style lounge in Centre Court. Four lifestyle vignettes, featuring products form YEC retailers, clearly identified very different lifestyle groups from the Bold Adventurer to the Fab Fashionista. Shoppers were invited to complete an interactive style quiz to identify their style profile and were rewarded with $20 gift cards on the spot. Other lifestyle events included a free Saturday morning yoga class (complete with branded yoga mats for all participants! ), a photo op where customers received a personalized, animated video, and two social media contests promoting YEC’s large variety of retailers that suit every shopper. Jennifer Valentyne, a Toronto celebrity and current host of The Bachelorette Canada After Show, joined the celebration and was available for photos and style advice, and was the shopping partner of a luxury grand prize contest winner! A targeted, strategic PR plan resulted in almost 50 million impressions including The Toronto Sun and NewsTalk 1010 Radio. An outstanding and truly successful Grand Reopening for the Yonge Eglinton Centre!